Last night was so mild out that Jordan and I sat on the porch together for a bit. Today? Snow and slush. I'm so over this Winter business. Had I watched the news this morning I would have found out that all the school buses were cancelled and let Sam and Jules stay home in their pjs. When the buses are cancelled the teachers make the kids watch movies all day. They can do that at home, as far as I'm concerned. Ten months until Christmas Eve. Just sayin. It's been a fairly quiet week with the exception of Wednesday: I spent the day at my mother's house with Jordan and Matthew, had an appointment at 4 and then met up with my friend Cindy at 8. Not much on the schedule this weekend which is nice. Being that it's Lent, I've decided to give up pop. I don't normally observe Lent, however the children attend a Catholic school and I wanted to be able to support them. Two days in and the caffeine headaches are murdering me. Still, I will keep going. I decided to give up the word "jackass" for Lent as well, but that only lasted as long as dinnertime on Wednesday. I was super hungry and when I get that way I get crabby and well, that particular word sort of slipped out. Mattie is on the verge of crawling. He gets up on his knees and will rock back and forth but hasn't figured out he can become mobile yet. In the meantime, he'll do this slithery belly move to get to the things he wants. He'll also stand up in his playpen, holding onto the edge, for a long while. He loves pears and ice cream. Other than that, there's not really much else to report. 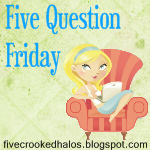 Being that it's Friday, it's time for Mama M's Five Question Friday blog hop. 1. What's your favorite way to spend down time (alone or with a significant other)? Reading or surfing the net. Sleeping ranks pretty high on the list too. 2. Are you the kind of person that wants things more as soon as you know you can't have it? I have certainly been this way at times in the past, but I try to focus on what I have and just enjoy that. I tend not to want a lot of things as I have all the things that matter already. A plane ticket so I could fly to Chicago in June to spend the weekend with my sweet friends. Not yet, but it's on my list of things I want to do. Ooooh... I'd like to do a blog review for a Sandals resort or a Disney cruise. Posted by Kate at 10:40 a.m.
You drive here and I'll drive the rest of the way to Chicago....deal?!?!?! Caffiene headache? just eat more M&M's...if I can get a caffiene high from them, they can take the edge off for you. More M&M's is always the answer.